Just looking at some of the 219 images on display. A wealth of talent on display for all to see- not to mention the refreshments! The annual NRPS Exhibition at the Methodist Hall in Midsomer Norton proved to be a popular diversion for Saturday shoppers at the weekend. 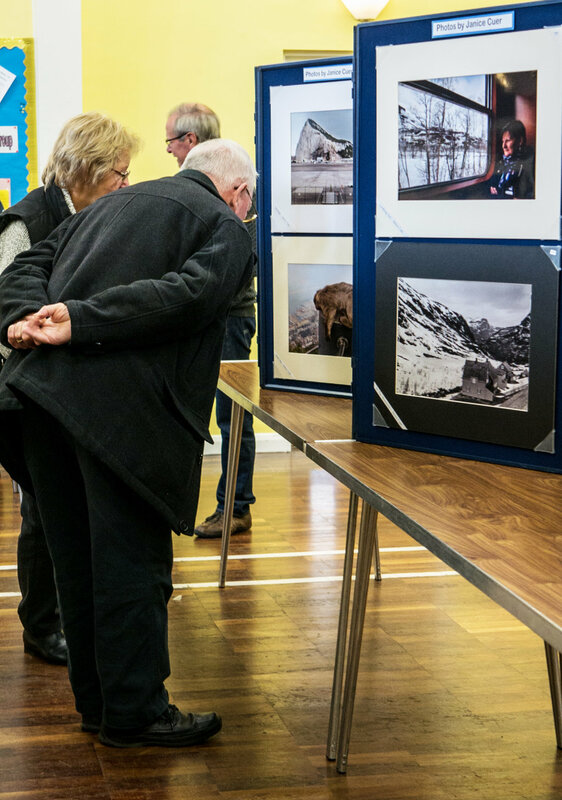 With most members attending, a total of 219 photos were on display, which was impressive given the total membership of the Society, which although growing, has yet to reach 30! There was something for everyone with the diversity of members’ interests and talents shown to good effect. The steady flow of visitors increased several times during the day, notably around lunchtime when, no doubt enticed by the smell of the bacon rolls and the promise of home made cakes served with a smile, people took advantage of the free entry, and the chance to both browse and graze. There were many positive comments about both the visual and the gastronomic delights throughout the day, and visitors were generous in their support for the raffle which always generates much needed funds for the club. The public enjoyed a range of high quality wildlife and landscape images that they have come to expect from the local group. Sporting moments were well represented, ranging from the thrills of rallying, motorcross and speedway, to the defining moments on the fields of cricket and rugby. Geoff Noad’s love of Photoshop and his skill in its use is well known, and his recent efforts to recreate the atmosphere and elegance of the planets were well received. Portraits of women, artisans , children and dogs attracted a deal of comment, and Ivy Goacher’s image of cyclists on the suspension bridge did well in the voting stakes equalling the eventual second place. However, it was newcomer David Chown’s high quality images that made the running in the Millenium Cup, as he dominated the field with his creative and technical expertise. His "Sri Lankan Leopard" gained votes equal to Ivy’s , whilst his “Words come to Life” got the most votes on the day, and it is nice to welcome a new Millennium Cup winner. It will be interesting to see how more established members approach the next Open Print competition, knowing what they might be up against! Entries for this November Competition in colour and monochrome are due by 1st November, and should be brought to the club that evening.